The Nokia N series is jam-packed with advanced multimedia features. A quick scan of the N80's features list shows a focus on imagery, as the phone boasts a sharp 3-megapixel camera, a second VGA camera, and image-editing apps. Though it's probably one of the most robust camera phones we've seen to date, it's not all about pictures. The quad-band N80 is a Symbian smart phone that lets you check e-mail (though not with push technology) and view Office documents - and yes, it's a decent phone. 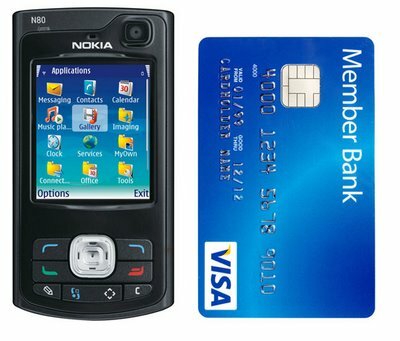 The Nokia N80 will appeal to gadget hounds and early adopters, but even then, you'll have to fork over some serious cash for the device. With no backing from a U.S. carrier, an unlocked version of the Nokia N80 will run you around $700. It's rumored Cingular will offer this phone, but that's unconfirmed as of this writing. 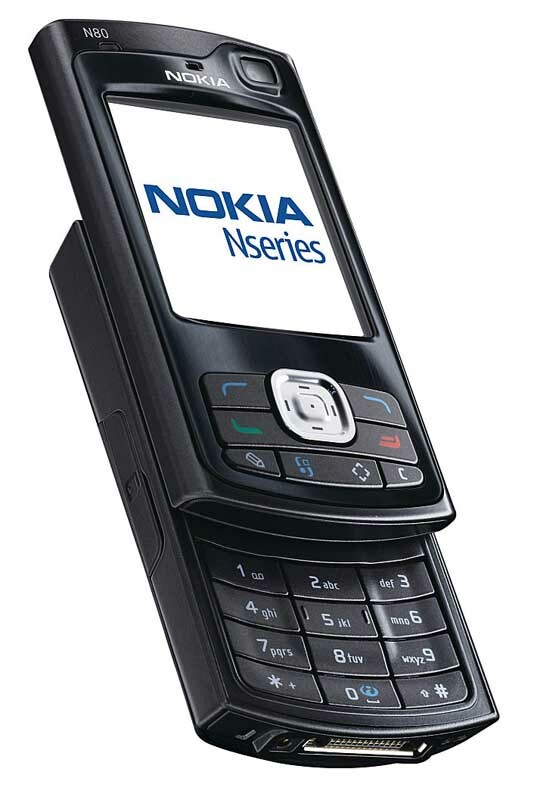 The Nokia N80 is a little cell phone, short and stout. In its closed state, the slider phone measures 3.7 by 1.9 by 1.0 inches and weighs 4.7 ounces. Though the form factor is compact, it's on the thicker side, so it'll make for a tight fit in a pants pocket. Despite the bulk, it's comfortable - though a little slippery - to hold in the hand, and its all-black case is attractive; the phone is available in stainless steel as well. The Nokia N80 has a beautiful 2.2-inch screen that boasts 262,144 hues at 325x416-pixel resolution. Colors pop, and text and images are extrasharp; it's certainly one of the best cell phone displays we've seen to date. Below it you'll find two soft keys, the Talk and End buttons, a four-way navigation toggle with a center select function, an edit key, a menu shortcut, a multimedia key, and a Clear button. For the most part, the controls are easy to use, but the toggle and the select button are a bit small, so you have to press them carefully. To slide open the cover, just push the face upward. The sliding mechanism is smooth and locks into place with a solid click. Once the phone is open, you'll have access to the numerical dial pad. The keys are large and adequately backlit, but the top row of numbers are closely lined with the bottom of the open face, which may cause some problems for users with larger hands. On the left spine, there's a Mini SD card slot, while the speaker and camera activation key are on the right. The placement of the latter is especially nice since it mimics the feel of a real digital camera when held horizontally. Consequently, though, it's a little awkward if you want to take a vertical picture. The camera lens is located on the back along with a flash and a switch that lets you change from normal to close-up (macro) mode. There's no self-portrait mirror, but it isn't necessary since there's a second camera lens on the front of the phone; it's positioned above the screen in the upper-right corner. Nokia packages the N80 with most of the basic accessories, including an AC adapter, a stereo headset, a USB cable, a wrist strap, a screen shammy, and a 128MB Mini SD card. The main draw of the Nokia N80 is its multimedia prowess - more specifically, its imaging features. The mobile sports a 3-megapixel camera with video-recording capabilities and 20X digital zoom. The breadth of customization and editing options available on this phone is astounding. You can choose from eight shooting modes, ranging from portrait to sports to night portrait, and five resolutions: 2,048x1,536, 1,600x1,200, 1,280x960, 800x600, and 640x480. You can tweak the brightness, contrast, white balance, color tone, and exposure value. There's also a self-timer and flash. The secondary camera is of only VGA quality, but then again, how often do you find a cell phone with two cameras? The shooting options are significantly reduced, with a mere two modes to choose from: automatic or night. 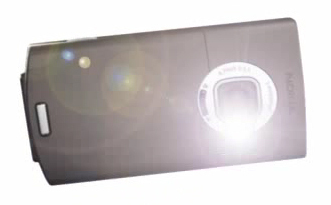 The N80's camera captures video with sound in MP4 or 3GP formats with up to 5X zoom. You get a choice of automatic and night shooting modes, as well as High, Normal, and Low quality settings. Most of the aforementioned customization features are also available in video mode. Once you're done with your shots, you can touch them up with the preloaded image and video editors. For photos, you can add clip art or text and reduce red-eye, while you can cut audio, trim clips for multimedia messages, and more for videos. Also, the photo-sharing options on the N80 are much more robust than those of other cell phones. In addition to being able to e-mail or save your images, you can use Nokia's Xpress Solutions to print photos, upload them to the Web, or transfer them to other devices. If you'd rather be entertained, there's an integrated music player that supports MP3, AAC, WMA, M4A, and eAAC+ files. To get tracks onto your handset, you can simply drag and drop files from your PC to the N80 via the included USB cable. The N80 will show up as a storage device on your computer. The mobile has an equalizer and can loop songs or play them at random. There's also an FM radio, but you must use included stereo headset to take advantage of this feature since the tuner is built into the headset. RealPlayer is also onboard, with 3GPP and MPEG-4 video streaming support. Now, let's not forget that the Nokia N80 is still a phone. The address book is limited only by the available memory (40MB), and the SIM card holds an additional 250 contacts. There's room in each entry for multiple phone numbers; work, home, and e-mail addresses; a birthday; and more vitals. For caller ID purposes, you can assign each contact a photo, one of 37 ring tones, or a group ID. The quad-band world phone also has a speakerphone, speed dial, voice-command support, a vibrate mode (called Pager Profile on this phone), and text and multimedia messaging. Other than cellular wireless, the Nokia N80 has integrated Bluetooth 1.2, Wi-Fi (802.11g), and an infrared port. The handset also supports Universal Plug and Play (UPnP), which means it can connect to TVs and home stereos over an 802.11g Wi-Fi network. The only catch is that UPnP devices are limited at this time. We like that the N80 automatically looks for available access points and you can be connected with just a couple of clicks (see Performance for more). The N80's Web browser is worth a mention too. Based on the Symbian's S60 software platform, the browser tries to prove a "true Web experience," according to Nokia, and includes some neat features. For example, it will present you with a thumbnail of the full Web page so that you can easily navigate to a certain point on the site, rather than having to scroll all over the place - very nice. Though the N80's main focus is on multimedia, it also comes with advanced PIM functionality and runs Symbian OS 9. The smart phone can access POP3 and IMAP e-mail accounts with attachment support, but there is no push e-mail solution available at this time. You can use the N80 to open and view (but not edit) Microsoft Word, Excel, and PowerPoint files. Nokia's PC Suite, which is available for download on the company's Web site, allows for easy synchronization and data transfer between your PC and phone. Other tools include a calendar, a calculator, a voice recorder, notes, a currency converter, and an alarm clock. You can customize the N80 with a number of preloaded themes or download more from the Web. The phone supports Java-based applications and ships with three games: Snakes, Card Deck, and Go To. We tested the quad-band (GSM 850/900/1800/1900; EDGE) Nokia N80 in San Francisco using Cingular's service. Overall, call quality was good. We noticed a slight echo, and our callers reported the same, but this didn't impede our conversation. Speakerphone quality was excellent. Our friends said there was no drop in sound quality, and volume was more than adequate. We also had no problem pairing the phone with the Logitech Mobile Traveller Bluetooth headset. Surfing the Web on the N80 was a pleasurable experience. Pages loaded fairly quickly, but we noticed a bit of lag time when switching between applications. Music playback was also pretty good. Audio was crisp and loud, but since the speaker is located on only the right side, sound was one-dimensional. Using the included stereo headset improved the situation, though. The Nokia N80 is rated for 3 hours of talk time and up to 8 days of standby time; in our tests, the phone managed 5 hours of talk time. According to FCC radiation tests, the N80 has a digital SAR rating of 0.86 watt per kilogram.